The report warns about the negative influence that drug and security policies have on juvenile justice systems in the region. It also presents an analysis of juvenile justice systems with a gender perspective, reporting on the situation of teenage women victims of State violence. On 22-23 October, DCI-Americas presented in Washington the 2015 monitoring report of the Regional Juvenile Justice Observatory, in which criminal justice systems in Argentina, Bolivia, Brazil, Colombia, Costa Rica, Ecuador, Paraguay and Uruguay are put under the microscope by DCI national sections. The report offers an updated version of facts and figures on teenage detainees in the region. It particularly shed light on the negative influence that punitive drug policies have on juvenile justice systems, and introduces a gender perspective by looking at the situation of teenage women victims of State violence. The report was presented to the Inter-American Commission on Human Rights Rapporteurs: James Cavallaro (Rapporteur on the Rights of People deprived of Liberty), Rosa María Ortíz (Rapporteur on the Rights of the child) and Paulo Vannuchi (Special Rapporteur on Freedom of Expression). 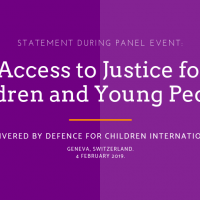 This report provides the Rapporteurs with crucial information on the situation of juvenile justice at the regional level, and will therefore allow them to use such information in their reports and make specific, evidence-based recommendations to States on the matter. Moreover, a meeting was held in New York with Marta Santos País, Special Representative of the Secretary General of the United Nations on Violence against Children, and her team, in order to analyse and evaluate the effect that punitive trends have on juvenile justice systems. The Special Representative affirmed and endorsed the great importance of in-depth and innovative analyses, like the ones conducted by DCI-Americas, in order to understand the role of drug policies on the establishment of punitive approaches towards adolescent populations. In addition, the gender approach taken by the Regional Observatory in its report, shedding light on the different forms of State violence that teenage women are exposed to, provided the Special Representative and UN staff members working on the specific issue of adolescent girls in contact with the law with crucial additional and up-to-date data. Thus, the Regional Observatory continues to meet its objectives by providing qualitative and quantitative information to promote specialized juvenile justice systems operating in accordance to the principles of the Convention on the Rights of the Child and to uphold the rights of adolescents in conflict with the law. You can download the full 2015 monitoring report of the Regional Juvenile Justice Observatory (Spanish only) by clicking here. For more information on the work of the Regional Juvenile Justice Observatory please contact Juan Fumeiro, Vice-president of DCI-Americas at: americas@defenceforchildren.org, or contact Rose Marie Acha, who coordinates the Regional Observatory on Juvenile justice, rosemarie_acha@dni-bolivia.org and rosemarie_acha@yahoo.com.